In Bangladesh (officially known as People’s Republic of Bangladesh) due to its past history and parliamentary democracy government is being important day by day. The people of Bangladesh were willing to have a democratic government system of their own, as they were ruled by the British and after separation from India in 1947 by Pakistan. This long historic event led the people of Bangladesh to create a democratic government system. After a bloody battle Bangladesh achieved the freedom from Pakistan in 1971 and finally got the chance to have a democratic government system. In 1972 the Constitution was implemented in order to ensure human rights and political freedoms within a system. But the system was impacted greatly by the British and United States governments. Later through various amendments the Constitution and the government system came to today’s position. In this long run Bangladesh had been ruled through autocratic means for several times up to the late 1980s. The single-party government system of the 1970s and 1980s was unable to satisfy the various political movements participated by common people of the nation. Various political parties of that time had completely different vision of the path that Bangladesh should follow but were united in their opposition to the rule of President Hussain Muhammad Ershad who had seized power in 1982, relegated the opposition to illegal activities and demonstrations on campuses and in the streets that periodically brought economic life to a standstill in urban areas. The stuggle for democracy became stonger and Bangladesh got the first democratic government in 1991. 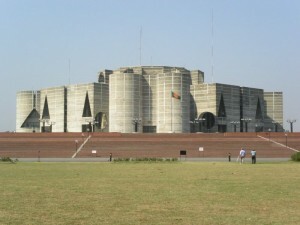 The name of the Parliament of Bangladesh Government is Jatiya Sangsad. It makes law for the state. The national assembly consists of 330 members, of which 300 are directly elected for a five-year term in single-seat constituencies from 300 part of the country. The remaining 30 seats are reserved for the women members whose are elected by the parliamentarians. The parliamentarians must be at least 25 years old. The parliament maximum seats for 5 years and must meet at least twice a year, and must meet less than thirty days after election results are declared. The prime minister is the head of parliament. Parliament elects a speaker and a deputy speaker, who take care of the parliamentary activities. Parliament also appoints a standing committee, a special committee, a secretariat, and an ombudsman. Various legislative bills, decisions and national budget are made from parliament on majority vote. Bills and budget are sent to the president for approval. The head of the state is President and the head of the parliament is Prime Minister. The Prime Minister forms the cabinet and runs the state as government. The prime minister is formally appointed by the President. President is the head of the state. From 1991, when Bangladesh having a parliamentary democratic government system the President becomes a largely ceremonial post elected by the Members of the Parliament. He is elected by the parliament members for a term of five years and will continue even after his term until a successor is elected. According to the provisions of the Sixth Amendment (1981) he may be reelected. He must be at least 35 years old. He is commander in chief of the armed forces, oversees the conduct of all foreign affairs, appoints the vice president for a five-year term and has the power to convene and dissolve Parliament. The President also chooses cabinet ministers, who run the government bureaucracy; heads a secretariat that devises money bills for introduction into Parliament; and appoints the members of the Elections Commission, who supervise all aspects of elections, Supreme Court justices and lower court judges. Parliament, in turn, can only impeach the president with a two-thirds vote and can only remove the president from office because of malfeasance or illness with a vote of three-fourths of its members. The President rules becomes more important than any time after the finishing of a elected government term when his executive authority is enhanced as said down in the Constitution of the country. Bangabhaban Palace is the office and residence of the President. 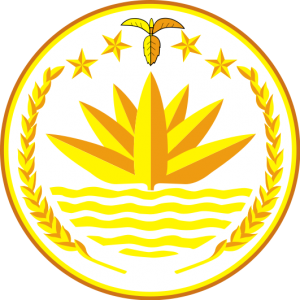 The cabinet is a presidential appointee to participate in the administration which is led by prime minister. Maximum one-fifth of the members of the cabinet can be outside from the parliament. The number of minister varies according political strategies. The other parts of the government are Judiciary, Civil service and Local administration. Later Secularity was replaced with “Absolute trust and faith in the Almighty Allah shall be the basis of all actions.” on 5th Amendment on 22 April 1978. And recently on 04 October 2010 the court declared the 5th Amendment to be illegal and restored the four basic principles of the original 1972 Constitution. The Constitution is closely based on the British and United States models as it includes various provisions for independent legislative, executive and judicial branches of government. At first Bangladesh had the Parliamentary System of Government which is switched to Presidential System then again to Parliamentary System at 1991. Election Commission: According to Article 118 of the Constitution provides the establishment of Election Commission. The President appoints the Chief Election Commissioner and other Election Commissioners if any. The Chief Election Commissioner cannot be appointed in the service of the Republic. Any other Election Commissioner can be appointed as Chief Election Commissioner, but is ineligible for appointment in the service of the Republic. prepare electoral rolls for the purpose of elections to the office of President and to the Parliament. The modes and procedures for holding elections to the members of Parliament are in the Representation of the People Order, 1972, as amended in pursuance of law. The general election of the Members of Parliament (MP) must be held within 90 days after the Parliament dissolved for the expiration of its term or of such expiration [Article 123 (3)]. is disqualified for such election by or under any law. At the same time any person can not stand to be a candidate for more than five constituencies. The Constitution also provides that no person can be a Member of Parliament at the same time more than one Constituency. If a person be elected for more than one Constituency then he/she has to vacate all other seats except one, as per procedure in law. Any elector of a Constituency may stand for election to that constituency who is qualified to be a member under the Constitution and the Representation of the People order, 1972. At the time of submitting nomination paper he/she has to deposit a sum of 5000/= in cash or in the Government treasury by himself/herself or by any person on his/her behalf. is or is deemed by law to be a resident of that constituency. Sub-section (8) of section 7 of the Electoral Rolls Ordinance, 1982 also empowers the Election Commission to re-group the electoral rolls if necessary, for the purpose of election to different elective offices. For the superintendence, direction and control of the preparation of the electoral rolls the procedures have been described in the Electoral Rolls Ordinance, 1982.